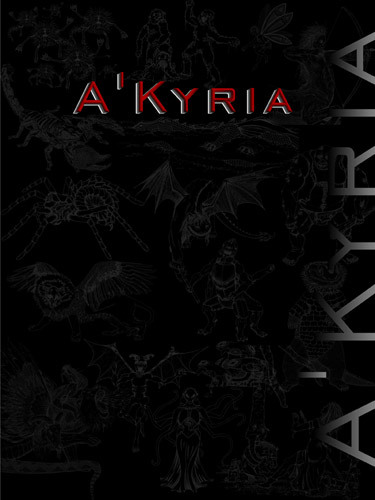 A’Kyria is a complete tabletop role playing game system, not simply a story-based RPG, set in the infinite world of A’kyria. Designed and developed by Our Own Game Company in Loveland, Colorado, the fantasy edition of A’Kyria’s Rulebook follows in the grand tradition of fantasy RPG adventure with Wizards and Warriors and Rogues; oh my! A’Kyria offers unique Races and Creatures, as well as, variations on the classics you love. The combat is d100 based and the advancement is Skill based. Plus, players can use the points they earn immediately to advance their character’s spells, skills, armor, weapons and more without waiting to “level” or “rank” up. This provides for an incredible range of diverse characters. With the A’Kyria Rulebook, you have everything you need to create a tabletop adventure in any type of land you wish, with a versatile, rigorously play-tested system you will love! A’Kyria is stand alone and can be played with nothing more than pencil, paper, dice and your imagination. Want a ready-made A’Kyria adventure? Be sure to check out our A’Kyria digital adventure pods! Choose whether you'd prefer to download your book, or have a paperback mailed to you. Downloads will be linked upon purchase.